Chris Corbin and Jeremy King have been partners in business for nearly 40 years. Together, the pair have created some of London’s most iconic restaurants. Along with the upcoming opening of Soutine in spring 2019, they continue to make a significant contribution to the hospitality industry. Chris Corbin and Jeremy King first met whilst working at Langan's Brasserie and Joe Allen's respectively, both influential restaurants on the London scene in the late 1970s. In 1981, they acquired Le Caprice and despite initial challenges, it soon become a huge success. In 1990, they opened The Ivy - a restaurant that over the following years consistently topped the guides as the most popular restaurant in London. The theme of restoring faded restaurants to their former glory continued with the purchase and renovation of J. Sheekey in 1998. 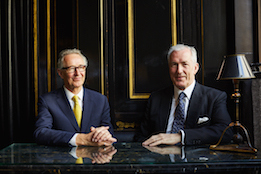 In the same year, Caprice Holdings Limited was sold to Signature Restaurants, and Corbin & King remained as non-executive Directors until 2002. 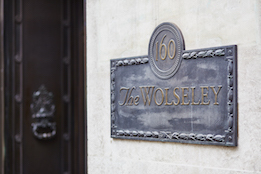 Corbin & King then acquired the site of 160 Piccadilly and their lifelong ambition to open an all-day brasserie-restaurant in the grand European style was realised with the opening of The Wolseley in November 2003. Corbin & King (formerly Rex Restaurant Associates until January 2014) was created to manage the future expansion of the company's interests and to focus on new opportunities in London and abroad, as well as manage the existing portfolio, including The Delaunay in Aldwych (December 2011), Brasserie Zédel on Sherwood Street (June 2012), Colbert on Sloane Square (October 2012), Fischer's on Marylebone High Street (Spring 2014), Bellanger in Islington (December 2015) and Café Wolseley at Bicester Village (June 2018).